We asked Ferdinand Dimailig, a principal at BOX Studios, to tell us more about Chicago’s recent influx of tech suites. Here’s what he had to say. What are tech suites and how did BOX get involved in this trend? A tech suite is a spec suite that has been enhanced through dynamic details; it allows the “vanilla box” office space to feel more tailored. For young tech companies, this is what makes the office more appealing than your average spec suite. 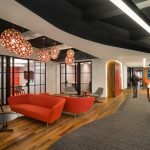 These creative environments have an open plan mixed in with unique details that can be simply personalized to the incoming tenant’s brand, without necessarily a lot more money. We have been designing urban tech suites in Class A and B type buildings where spaces have been sitting vacant, typically on lower floors or offices with challenging exterior views. Because of our experience with companies like Groupon, Lightbank, Threadless, and Fair Life Brands, we have been approached by a variety of building management groups to design creative spaces that could attract these types of clientele and fill those challenging leasable spaces. What sort of companies are looking to move into the suites? Companies that are less concerned about the exterior view or floor level of the space and more concerned about the location, building amenities and design of the space. These fast growing companies/tech firms have out-grown their home office or collaborative incubator space. They’re organizations that might have started with 3-5 employees and are now quickly expanding to 20 or more people, or firms who are ready to take the next step in growing their business. Chicago has become the “Silicon City” of the Midwest, so we are seeing a lot of these companies moving downtown, specifically to the “loop”. The younger employee base want to work in the city and be in a vibrate environment. Mayor Emanuel is an avid supporter, who is encouraging this type of urban growth. He believes that the fabric of the city is enhanced by these fast-growing companies and that they are one of the keys in securing continued economic growth in our world-class city. Can you give examples of recently designed tech suites? What have you found that the clients are looking for? We’ve designed tech suites for a number of prominent real estate companies. What’s amazing to me, is that often times, the building management company (our client), doesn’t even have to build out these spaces to get people to want them. Suites are being leased based on our floor plan design and 3D renderings. With that said, furniture dealers and manufacturers are getting involved in this trend as well. They have been offering flexible economical solutions to the client in order to furnish the suites. This allows the client a creative solution in budgeting and marketing the space. In terms of the design, these companies want a functional open plan, flexible simple furniture, exposed ceilings (structure deck, electrical conduits and mechanicals) and brand identity. Something “cool” that company can move into and simply make their own. A design reminiscent of the creative industrial office loft spaces, popular during the dot.com era of the 1990s. What is different now is the move towards employee wellness and work efficiency. We are now designing work environments that shrink the personal space, but expand the collaborative and private work opportunities. People like working in an environment that offers an alternative workspace: reception areas with interactive furnishings and beverage stations, comfortable café/kitchen lounges, adjustable height workstations, communal meeting style tables and mini private quiet rooms are all popular planning requests. More recent unique design requests have included no reception desk up front and nap rooms. How do you see tech suites translating to other communities for other markets? I think the tech suite office design was actually behind the trend of other workplace markets. I believe our designs were heavily influenced by our experiences in healthcare, education, restaurant/retail, and residential projects completed in the past. By working in other marketplaces, we were able to approach things differently and find unique design solutions that others may not have thought about implementing. How do you see tech suites growing? Many of the well-established players in the real estate world are very interested in the next generation of tech suites. Originally, these spaces were planned to accommodate growing companies in 3,000-5,000 square feet, but now the spaces are becoming larger. We are currently working on tech suite projects in the 12,000-16,000 square foot range, for companies who have all embraced the concept of enhancing employee wellness and work efficiency. Chicago has gained significant strides toward being recognized as a solid tech hub, with local success stories like Groupon, Threadless, and GrubHub. I believe with the tech boom, influx of professional talent and the big city environment all will lead to a bright future ahead.